By buying this product you'll earn up to 135 Rewards points. Ever had your dog or cat wake you up earlier than you'd like on the weekend because you missed the usual morning feeding? The PetSafe Healthy Pet Simply Feed is the answer to that problem, and so many more. The PetSafe Healthy Pet Simply Feed™ feeder helps with portion control and keeps mealtimes regular. Just load the hopper with food, place the included stainless steel bowl under the spout, and then program the feeder to dispense food in the right portions, and at the right time. Some pets eat too quickly and make themselves sick. Others need small portions throughout the day for weight control. 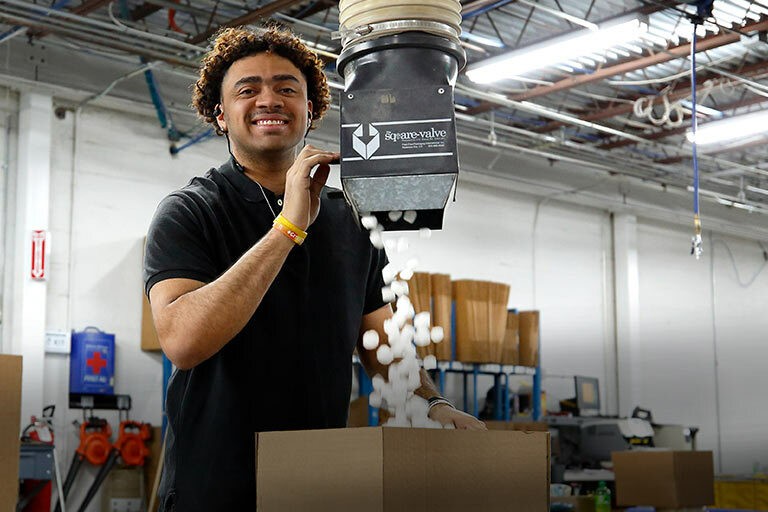 The Simply Feed has a built-in LCD screen so you can program it to dispense exactly the right amount, at exactly the right times throughout the day. You can vary portions from 1/8-4 cups and have them dispensed in up to 12 separate meals throughout the day. Could this be used for feeding miniture horses where they are fed hay pellets? Could you put it outside and let it fall in a tub? The unit is not water or weather resistant. It is battery powered (4 D cell batteries, not included) so you wouldn't need an AC power outlet but it is not made for use outdoors. 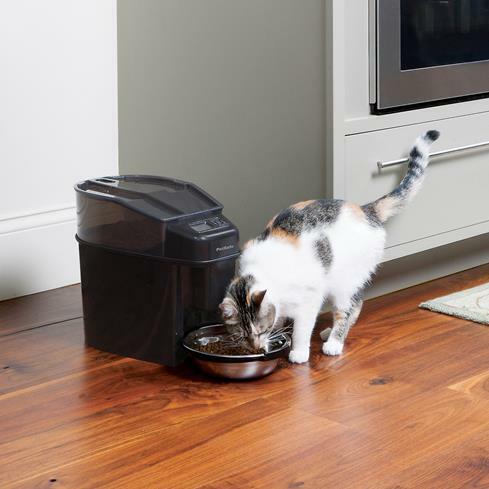 Overview: The PetSafe Healthy Pet Simply Feed is an automatic pet food dispenser that lets you control when and how much food your pet gets. 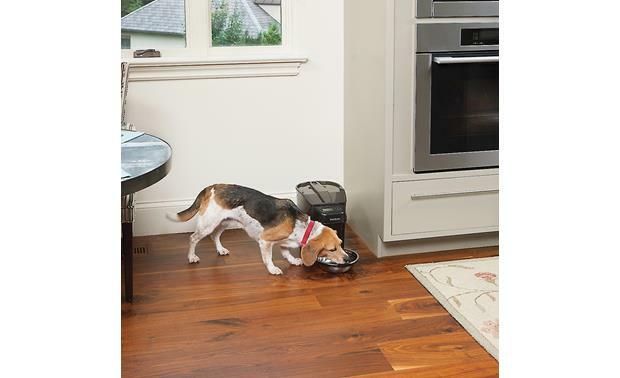 With the top-mounted control panel, you can schedule your pet's meals, and the control the amount you feed them. 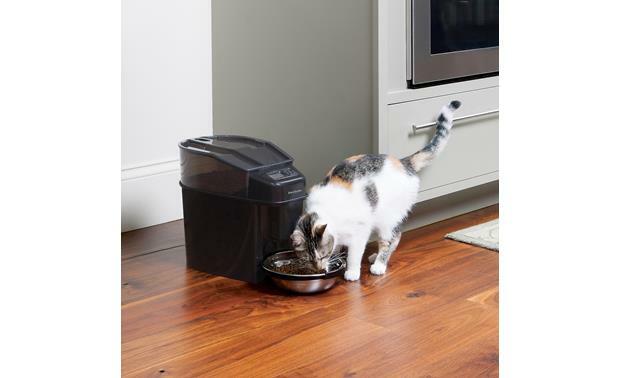 Simply Feed can be used for cats or small-to-medium sized dogs, and includes a stainless steel bowl with a holder that keeps it in place under the dispenser. Design: Simply Feed features a unique conveyor design that dispenses dry or semi-moist food without clogging. The locking lid and BPA-free plastic exterior are tough enough to keep your dog from "breaking in" to get a snack. The translucent hopper can hold up to 24 cups of food, which you can dispense in portions of 1/8 cup to 4 cups at a time. Control Panel: Healthy Pet Simply Feed is equipped with a 5-button Control Panel with a 2" LCD screen for programming your pet's feeding schedule. Initial setup includes setting the time, time format (12-hour/24-hour), and feeding schedule. You can choose a default schedule for your dog or cat, or a user option to customize your pet's feeding schedule. If you choose a default schedule, Simply Feed dispenses two meals per day, at 8:00am and 5:00pm, of 2 cups (for dogs) or 1/4 cup (for cats). To set a Custom Feeding Schedule, you will need to set the number of feedings per day (1 to 12), feeding time of each meal (hour and minute in 15-minute increments), and meal portions of each meal (1/8 to 4 cups in 1/8-cup increments). Meals are programmed individually, so you can feed different portions at different times of the day. Slow Feed Mode: If your pet is a fast eater, the unique Slow Feed mode dispenses meals of more than 1/8 cup over a 15 minute period to help prevent gulping and vomiting. Immediate Feed: A convenient Immediate Feed button is located on the top panel to instantly dispense the next scheduled meal at any time. Only one meal can be immediately fed; a meal must be automatically dispensed before you can use Immediate Feed again. Pause Feed Mode: If you need to temporarily stop scheduled feedings without reprogramming the feeder, you can set the feeder to Pause Feed Mode. While in Pause Feed Mode, the feeder will not dispense any food into the bowl. You must manually cancel Pause Feed Mode in order to resume the feeding schedule. Cleaning: The Simply Feed disassembles for easy cleaning. The hopper, lid, bowl, and bowl holder are all dishwasher-safe (top shelf). The conveyor and crumb catcher can be washed by hand in warm, soapy water. A cleaning brush or toothbrush can be used to remove food particles from the conveyor belt. You should set the feeder to Pause Feed Mode while cleaning. 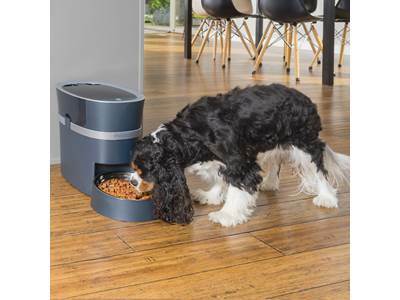 Power Options: The PetSafe Simply Feed is powered by 4 D-cell batteries (not included). The estimated battery life is one year. An optional power adapter (PAC00-15035) is available from the manufacturer if you wish to power Simply Feed with household current. 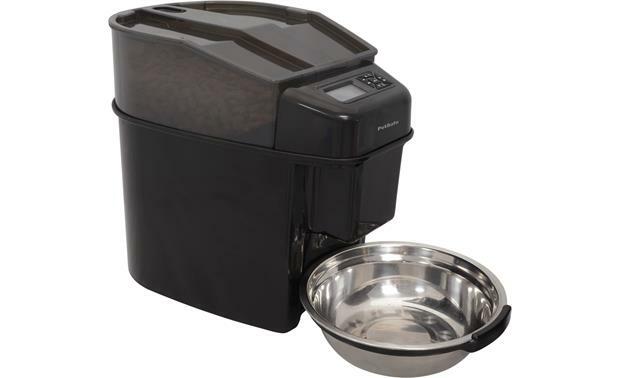 Searches related to the PetSafe Healthy Pet Simply Feed™ Programmable automatic pet feeder.